You might know Pavilions Hotels for the group’s luxury resort in Phuket, or perhaps you’re familiar with the brand through experiential stays like the adventure camp Pavilions Mongolia. While each of these hotels is luxurious in its own right, they differ greatly in almost every other way. Each hotel and resort in the Pavilions collection is designed to exhibit its own style, atmosphere and experience, as they reflect the destinations they’re in. The thread that runs through them all is instead the focus they place on the local community. The co-founder and CEO of Pavilions Hotels & Resorts, Gordon Oldham, is this theme’s driving force in partnership with the group’s other co-founder Douglas MacLagan who was recently given the UNICEF-endorsed World of Children Humanitarian Award for his charitable work in Nepal where The Pavilions Himalayas is located. On top of this, a new wellness center has just been revealed at the resort in Bali; Pavilions will begin running expedition cruises from Phuket in September, with wellness cruises being launched in November; and plans to renovate a chateau in Provence are underway with a projected opening date of 2019. Perhaps the most high profile project though is the development of a resort with branded properties in Niseko, Japan. “In Niseko, we have 20 hectares of land, with a village and hotel that will open at the end of next year, and we have residential lots,” Oldham elaborates. “It’s a gorgeous area located just two minutes away from Hirafu and its community. The hotel will look like an onsen hotel with modern Japanese dining.” This opening is slated for 2019, and just like the other hotels in the group, it will highlight the inspiration that’s been taken from the destination, along with its culture and community. 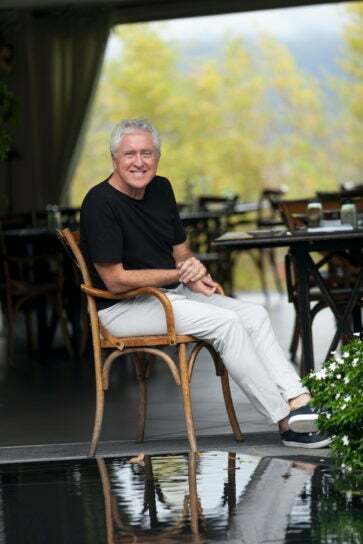 While succeeding to capture adventure, romance, culture and art in each of his properties, Oldham makes a point of ensuring hotels connect guests with the community. This could mean dining with the chef of a local restaurant in Rome, experiencing life in a Mongolian yurt or taking a masterclass in Nepali cooking at Pavilions Himalayas. Even with so many plans in progress, development remains relatively spontaneous. “I know that if I laid a plan out for the next five years, it would probably be disrupted,” he says, “so you just need to remember everything you’ve learnt in hotel school as you continue to evolve.” With such energy and excitement poured into each individual hotel and resort, you can be sure there’ll be more experience-led properties on the horizon where the people and place are championed as its most distinguishing characteristics.